A partnership between Hunter New England Central Coast Primary Health Network, Hunter New England Local Health District and Hunter Primary Care. 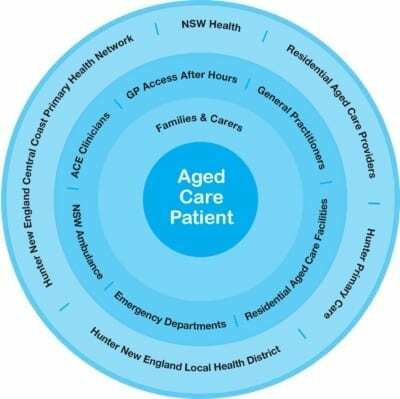 The Aged Care Emergency (ACE) service is dependent on collaborative relationships with Residential Aged Care Facilities (RACFs), NSW Ambulance and General Practitioners (GPs) residents, families and carers. The service provides triage, consultancy, clinical support, and advice for RACF staff and GPs, so that care for patients can be delivered in the facility where appropriate, and transfer to hospital is avoided. If the patient does need to be transferred to hospital, the ACE clinicians can facilitate the process and provide information about the patient to hospital staff prior to admission. The ACE service can provide information, and where appropriate assist with the coordination of outreach or outpatient services for clinical issues such as wound management, continence problems, behavioural issues, IV antibiotic therapy, and the management of some acute and chronic conditions. The ACE Service is a model of care that has a multi-faceted approach comprising 7 key elements. At the centre of the model is the resident and ensuring that they receive the right care at the right time and in the right place. The use of evidence based algorithms to manage common health issues within the Residential Aged Care Facility. A 24hr telephone consultation service, supported by Registered Nurses, for Residential Aged Care Facility staff to access clinical guidance. Identification of clear goals of care prior to transferring to an emergency department. Proactive case management within the emergency department. Education and empowerment of Residential Aged Care Facility staff. Through: Management workshops, Train the trainer workshops and 2hr onsite in-service workshops. Collaborative relationships with Residents, Families and carers, Residential Aged Care facilities, General Practitioners, Hunter New England Central Coast Primary Health Network, NSW Ambulance and emergency departments have been developed. A management team to implement and support all the above elements. Enhance Residential Aged Care staff decision-making for residents with non-life threatening acute care by the use of standardised guidelines. Reduce unnecessary presentation of aged care residents to emergency departments. Improve communication and collaboration between stakeholders in the management of aged patients. Ensure aged residents receive the right care at the right time and in the right place for unexpected health conditions. The ACE team have created the ISBAR4AC form to assist Residential Aged Care Facility staff to handover clinical information when escalating concerns. This double-sided form is a fantastic tool to help your staff deliver a clear, concise and professional handover. You can order these via the link below.